How many gates do I need to pass through to get to the Tokaido Sanyo platforms? When should I pass through these gates, if I want to eat at a restaurant before boarding? I need to pick-up my ticket at a vending machine as well, when should I do this? Is there any possibility I will exit/enter the wrong gates? Any information is appreciated! I have about 2 hours between the arrival of my N'EX train and the departure of the Shinkansen. The NEX comes in on the Sobu tracks on level B5 on the Marunouchi side. You will need to go up to the main level as the B5 level doesn't connect to the Gransta basement level, if that is where you are thinking of eating. The Shinkansen tracks are on the Yaesu side. 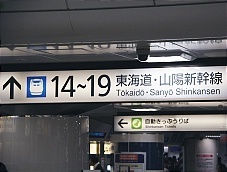 Once you are on the main level there are a lot of signs for the Tokaido shinkansen. It will be more crowded on the main level so if you have suitcases it can be harder to transverse. As long as you don't pass through the gates to go to the restaurant you are planning to eat in it's not a big deal. The gates are fairly obvious and you must insert a ticket in them to exit, do you will know when you reach them. You will need to pick up your shinkansen ticket before you will be allowed through the separate gates for the shinkansen. There are many many many places to eat in Tokyo Station. We've gotten breakfast inside the station before as well as eaten dinner. If you want something more to go to eat on the shinkansen (which is fairly common) there are lots of options as well. I've personally never picked up a pre-purchased ticket from a vending machine nor taken the Nozomi. Every time I've used the shinkansen I've had a rail pass because I am usually doing a lot of traveling. Just fly; it will be both cheaper and faster (since you're taking a Nozomi, you don't have a JR Pass). Direction to Shinkansen platform is clearly marked, separate from all other platforms. So look up for signs and follow them. I'm not sure what you mean by "pick up" ticket at the vending machine. You can buy Shinkansen tickets at a vending machine, or you can buy at ticket office from a live person. Most of the restaurants at Tokyo station are located in the basement. During lunch time most restaurant get crowded and you may have to wait. Some restaurant sell using vending machine, so you decide what you want first (there are usually wax model menu on outside) and buy the tickets for your meal. There are kiosks inside the gated area (where you enter using tickets) where you can buy food, which you can eat in the waiting area or on the train. To enter a gate (turn style), you insert the tickets. If you insert a wrong ticket, the turn style will not open. Two hours should be sufficient for you to eat a meal and find your way to the Shinkansen platform. Did you check how long it will take from NRT to Shin-Yamaguchi station? You ought to book domestic flight. But no flight from NRT, you have to go to HND by train or bus first, then flight to UBJ. This website does a pretty good job of describing the process of getting the tickets though the person sharing their experience was using Shin-Osaka Station. The information booths in Tokyo Station are very good and the people working there definitely will know English, so if you have any problems they can help. If it was me, before boarding your NEX in Narita I would forward any large suitcases onwards to where ever you are staying in the Shin-Yamaguchi area. That way you won't have to take a bigger suitcase up from the NEX line to the shinkansen line and have a large bag with you while trying to eat. There are lots of escalators coming up from the Sobu/NEX train lines though if you have a bag. There is also at least one elevator. The GranSta basement level if I remember correctly has a lot of places selling take out. There are some ramen shops and other sit down places on "Keiyo Street" which is an area of Tokyo Station near the transfer to the Keiyo line. It's actually not all that inconvenient to the shinkansen. I actually ate there before catching my Tokaido shinkansen. The cafe I ate breakfast in might have sandwiches. There are lots and lots of foods you can eat in Tokyo Station. The shinkansen also sells food on board if you're not a particularly picky eater. We tried one of the limited edition cakes on the Hokuriku line last trip and it was OK. I think my daughter liked Mister Donuts more. It's about 30 minutes longer to take the shinkansen vs. flying to get to Shin-Yamaguchi and probably good 10,000 yen more expensive to take the train. OP has not said if that is their ending destination or they are continuing onwards via local train or bus. However, I can also see the allure of the train after having sat on a plane for 12 hours and it can be nice to have a little bit more time to look around Tokyo vs. racing to Haneda for a flight. My last trip I could have flown from NRT to Itami (We have no direct flights to KIX.) and then gone to my hotel in Osaka and it maybe would have saved us an hour or two, but I also knew my daughter and I don't like any of the dinning options in NRT and trying to find dinner in Osaka at 20:30 or later with a 7 year old was going to stink. So instead we went NRT to Tokyo Station where I knew the ramen place she loved was and then caught a Hikari, as we did have rail passes. - there will be lots of signs for the Shinkansen tracks. Easy to find. - the main station area will have more in the way of restaurants. Some of them, in some stations, will be pretty good, as many larger stations have shopping malls attached. This advice pretty much works for most decent-sized city train stations. You’re never going to starve when traveling in Japan. Some of the food will just be functional and some will be really good. especially when he/she gets to Tokyo on a Narita Express train. then reach a correct Shinkansen gate. you carefully follow sings for Tokaido and Sanyo Shinkansen. leave for the right in the above-link Tokyo Station's map. I recommend you also look at pictograms representing Shinkansen. for Tokaido and Sanyo Shinkansen. for Tohoku, Joetsu and Hokuriku Shinkansen. you renew the Smart-Ex ticket in advance of your train ride. I see this comment frequently - Shinagawa is really not that much smaller or more simple. The number of tracks, exits, companies and size for many users it is similar. And, when busy, is much more packed with people than Tokyo IMO. But all the trains are st ground level and all the lines are parallel, making things much easier. Personally, I prefer to transfer through Tokyo Station because I have dietary restrictions and I know Tokyo Station has places that suit my needs. Shinagawa does not have as many options. I also tend to stay in the Tokyo Station area so it's just a station I'm super familiar with. I think there is also just the perception a lot of foreigners are going to come through it, so I find if you need help, the people working there are very knowledgeable and fluent in English. If you do have dietary restrictions there are many places where finding something to eat will be challenging and I find some stations have a lot less through their ticket gates than others. I always find Kyoto Station has tons of places outside the ticket gates but a surprisingly small number of options once you've passed through the ticket gates, a lot fewer than you would expect considering it's Kyoto Station.